Your AmeriCorps program budget (as approved in your grant agreement) is the blueprint that will help your organization meet its goals and objectives and ensure that match requirements are met. It is the responsibility of the program to review and compare the budget to actual expenses, assure that any necessary budget changes are properly approved and verify that any movements between line items fall within the guidance provided in the most recently updated AmeriCorps Terms & Conditions for AmeriCorps State & National Grants). It is crucial to have a reliable and accurate accounting system that will enable you to keep track of the program’s financial progress. The Corporation acknowledges that budget revisions are sometimes unavoidable and sometimes are required more than once in a program year. Thus, programs may move funds between line items without Commission or CNCS approval if the cumulative amount moved is less than 10% of the total grant amount, as long as the transfer is in compliance with all applicable standards and requirements articulated in the grant agreement and/or AmeriCorps Regulations (45 CFR§2543.25). Example: A program that receives a $100,000 grant may move a cumulative total of up to $9,999.99 between line items without Commission or CNCS approval as long as the transfer is in compliance with all other applicable standards and requirements. 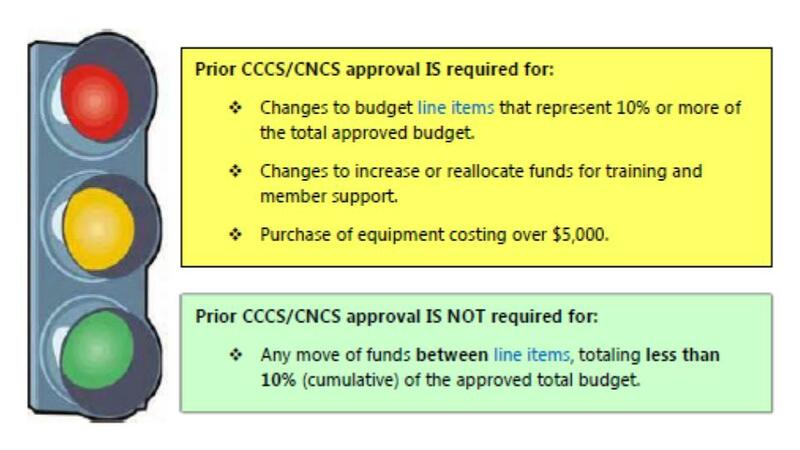 Programs that wish to transfer funds totaling 10% or more of the total grant award, wish to increase or reallocate funds for training and member support, or to purchase equipment costing over $5,000 must submit a budget modification request via the Commission's OnCorps Reporting Portal and receive prior approval from the CCCS and CNCS. Programs should explain changes made to the revised budget in the space provided for justification of changes on the request form. Programs should not consider budget modification requests approved until written notice of approval is received from the Connecticut Commission via the OnCorps Reporting Portal and/or the Corporation. Questions about budget modifications should be directed to the CCCS Executive Director. Instructions for submitting a Budget Modification Request in OnCorps are accessible in the OnCorps Reporting Portal Help platform. Administrative (indirect) costs are general or centralized expenses incurred for the overall administration of an organization receiving Corporation funds. These costs may include general expenses related to overall administration for the legal applicant or costs incurred for the common/joint objectives within the organization that are not readily identifiable with a particular project or cost objective. However, administrative costs do not include costs specific to the AmeriCorps program. All programs select one of two options for calculating their administrative cost rate at the time of grant application or continuation request. For organizations that have an established indirect cost rate for federal awards (IDC), administrative costs refer to those costs that are included in the organization’s indirect cost rate agreement. Such costs are generally identified with the organization’s overall operation and are further described in Office of Management and Budget (OMB) Circulars (also called Omnicircular, Supercircular, or Uniform Guidance) A-21, A-87, and A-122. If your organization is using an established IDC, there is also a 5% cap on the total federal share that can be applied to administrative costs. Uniform Administrative Requirements, Cost Principles, and Audit Requirements for Federal Awards (Uniform Guidance, now consolidated in 2 CFR Parts 200 and 2205 apply to CNCS award and grants management processes. A recent change to Uniform Guidance relates to indirect cost rates. To maintain a record of each AmeriCorps program’s chosen method of claiming indirect costs, CNCS has established a feature in eGrants for funding recipients to record the method which you will be using to apply your indirect costs to all CNCS awards. Programs must record the indirect cost rate method and rates which you will be using on your awards. Step-by-step instructions on how to enter indirect cost rate information into your eGrants account may be downloaded from the following CNCS link: http://www.nationalservice.gov/resources/uniform-guidance. This CNCS National Service Uniform Guidance Resources page also includes regulations, guidance, frequently asked questions, and archived updates. Costs attributable to members including: living allowances, insurance payments, and expenses for training and travel. Costs (including salary, benefits, training, and travel) attributable to staff who recruit, train, place, support, coordinate, or supervise members. Costs (including salary, benefits, training, travel) attributable to staff who develop materials used in member recruitment, training, placement, support, or supervision. Costs for independent evaluations and internal evaluations to the extent that the evaluations cover only the funded program or project. Costs, excluding those already covered in an organization's indirect cost rate, attributable to staff that work in direct program or project support, operational, or oversight capacities, including but not limited to: support staff whose functions directly support program or project activities and staff who coordinate and facilitate single or multi-site program and project activities. Space, facility, and communications costs for program or project operations and other costs that primarily support program or project operations, excluding those costs that are already covered by an organization's indirect cost rate. Other allowable costs, excluding those costs that are already covered by an organization's indirect cost rate, specifically approved by the Corporation as directly attributable to a program or project. Programs must provide and account for the matching funds approved in their applications to the Connecticut Commission. This includes budgets that exceed the minimum grantee match requirement. Programs must report program collection of cash and in-kind match on a quarterly basis via the Commission's OnCorps Reporting Portal. By the end of each grant year, the grantee must have contributed either the proposed matching resources or the minimum overall share match (see below), whichever is greater. Programs that do not meet the match proposed in the grant application may be subject to suspension of funds, grant termination or recovery of funds by the CCCS. According to OMB Uniform Guidance, programs cannot charge the cost of “organized fundraising” or expenses incurred “solely to raise capital or obtain contributions” to the AmeriCorps grant. Any staff person supported by the AmeriCorps program is also covered under the OMB Uniform Guidance and thus may not participate in these activities while charging time to the AmeriCorps grant. All staff should have clear time records that detail and distinguish the time they spend on these and other activities. AmeriCorps members are not, typically, permitted to support their organizations with major fundraising efforts. They can, however, do some fundraising activities, as long as they do not spend more than 10% of their total hour commitment on such activities. This must also be reflected and clearly distinguished from other activities in the member time records. Acceptable fundraising activities are outlined in 45 CFR§2520.40. Some programs will have activities that generate income. Program income includes income from fees for services performed, from the use or rental of real or personal property acquired with grant funds, from the sale of commodities or items fabricated under a grant agreement, and from payments of principal and interest on loans made with grant funds. Program income should be used toward matching funds (grantee share). For details on the use of program income, please refer to 45 CFR§2541.250.